Mark Hamill, aka, Luke Skywalker, not only plays a Jedi Master in the Star Wars franchise, but he’s also one in real life when it comes to social media. In particular, the legendary geek excels at Twitter, especially when it comes to trolling Star Wars fans. In the past he’s pretended to be cosplayers at conventions even though he wasn’t really there, and he’s always good for a laugh if you’re a Star Wars fan thanks to his daily interactions with his fans. This past week featured a perfect example of how Hamill uses his Twitter account to have fun with adoring Star Wars fans. A fan had posted a comment that said if he didn’t get the official title for Star Wars: Episode IX soon, he’d get it out of Mark Hamill himself. Well, Mark picked up on the comment and made sure to troll the fan, as well as other Star Wars fans with an Ariana Grande inspired response. As you will see below, Hamill’s reply is about as perfect as it gets for someone who likes to troll die hard Star Wars fans. He even went as far as to doctor up a graphic to complete his trolling, so once again Mark has proven he’s a great follow for Star Wars fans, and really for good people in general. 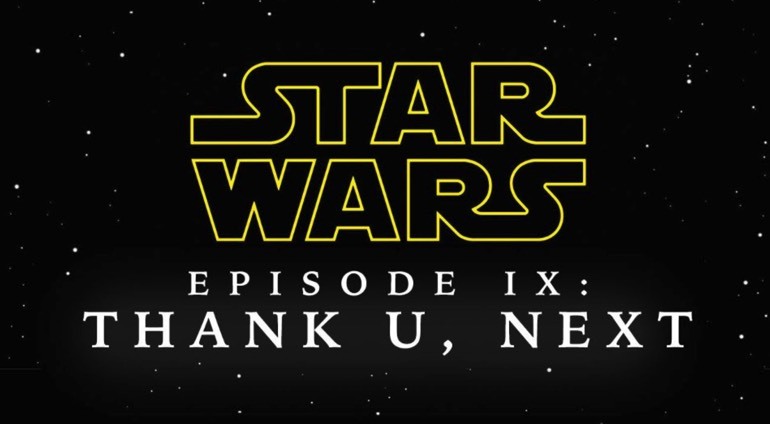 Here’s to waiting for the actual official title for Episode IX!